“Kittykat23uk” and all: the following three links should help you determine which destinations have the highest mammal diversity and possibly cost-efficiency (depending on travel costs). Click on any of the maps to enlarge. Link to download higher resolution maps is on the bottom of the page. *** All-important caveat *** : just because many species occur in an area doesn’t mean that any of them is common there. In fact, species-rich areas are frequently ecotones or transition zones, where many species mix as they reach the edges of their geographic ranges. This means they have low population densities there. Example: some species are common in lowlands, others in highlands. This means that the middle elevation will have the highest species diversity since this is where highland and lowland species intermix. But both groups are at their range fringes there, and hence will usually be uncommon. It would be far better to spend a few days in the lowlands and a few in the highlands, where the respective species are common, rather than in the species-rich middle ground. Also, these maps show quantity – species richness – not quality. Perhaps it would be better to create a most-wanted mammals list, then note destinations where each species is most common, then choose the one that has the most desired species. Radio-collaring – do the ends really justify the means? A fun citizen science project: look through camera trap images of wildebeest and record behaviors you see. Details here. 7. Weird & wonderful mammals e.g. anteaters, spring hares, viscachas, aardvark, platypus, echidna that sort of thing etc. 1. India -several trips, covering Ladakh, Tadoba, Bandhavgarh, Ranthambhore, Corbett, Chambal, Kanha, Pench, Little Rann of Kutch, Velavader, Gir. Biggest miss so far has been dhole & striped hyena. 4. South Africa – Mainly Kruger & surrounds & around the Cape, plus Mozambique (humpbacked whales, dolphins). Next trip in September, will cover Kgalagadi, and Karoo areas including Marrick/Dunedin Farm for lots of small mammals I’ve not seen yet. 5. Brazil- Pantanal only- Planning for next year- hoping to cover Canastra National Park & Caraca monastery for maned wolf plus get some of the species I missed like tapir & giant anteater- possibly will be looking for people to join me, PM if interested. 6. Finland- wolf, brown bear and wolverine. 7. USA- Yellowstone only (wolves, bears, pronghorn, beaver etc). 8. Spain- Iberian lynx- but need better views. 9. Borneo- Just been, have to go back at some point for the clouded leopard which we missed. 10. Madagascar- southern route only (Andasibe, Ranomafana, Ialatsara, Zombitse, Isalo & other reserves off the main south road down to Toliara). 11. China- Sichuan, red panda, tibetan fox & wolf. 12. Zimbabwe- Mana Pools only (wild dogs). If you are looking for the Platypus and Short-beaked Echidna, the best place to head is the lush lands east of the Great Dividing Range in Australia. The Echidna is common across Australia in any habitat while the Platypus is most common in this area as this is the most moist and fertile area in the country. They can both be readily seen in this area at various sites, often close to major cities like Sydney or Brisbane. 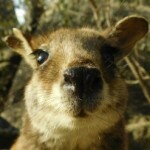 And you can also fill up your life list of weird and wonderful mammals a little bit more on the way by seeing some of the other strange animals of this corner of the continent including Eastern Grey Kangaroos and other macropods, Koalas, Flying-foxes, Dasyurids, Bandicoots and many others.